We reserved a day for sightseeing and shopping during our Mission Trip. 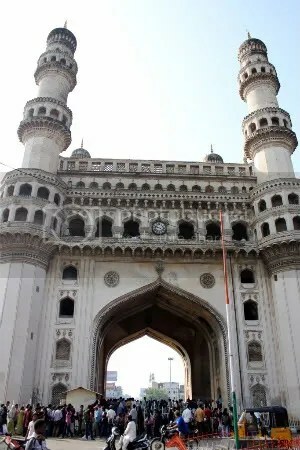 We can’t leave the place without seeing all the famous landmarks in Hyderabad or not experience shopping there can we? 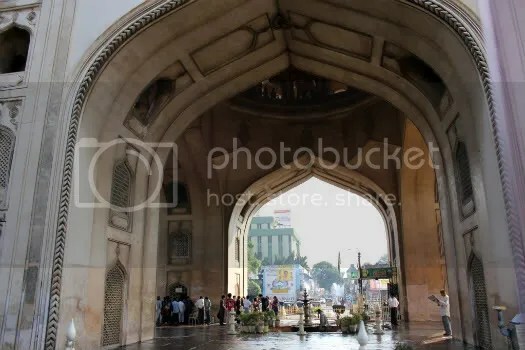 Our bus drove past the huge and magnificent Charminar and according to Wikipedia it means “Mosque of the Four Minerets”. It is said to have been built by Sultan Muhammad Quli Qutb Shah to commemorate the plague from the city. The Minarets are four stories high, each ring representing one. You can see dark shadows people on the second level in this photo. We stopped along a road to take a leisure walk around the area. There were make-shift stalls set up on carts like this piled with all sorts of goods on sale. 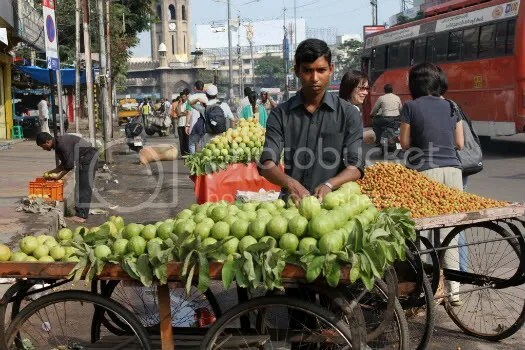 This man was selling guava. 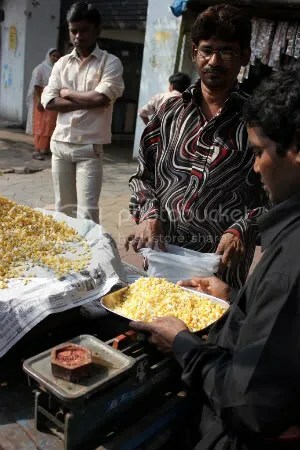 I can’t believe we bought corn kernels in India. Everyone was just itching to do some shopping! Old metric weights used here to weigh out the goods. This little yellow vehicle is a taxi of sorts. 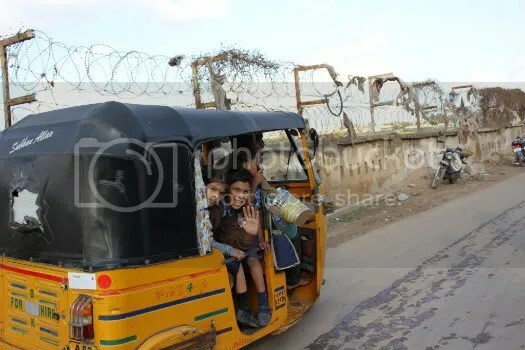 The photo itself was taken near a slum but you will find this everywhere in the city. It’s amazing how so many people can pile onto such a tiny vehicle. 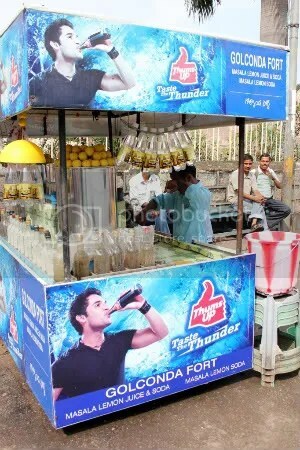 A drinks stand outside Golkonda Fort selling the local favourite, Thumbs-up! 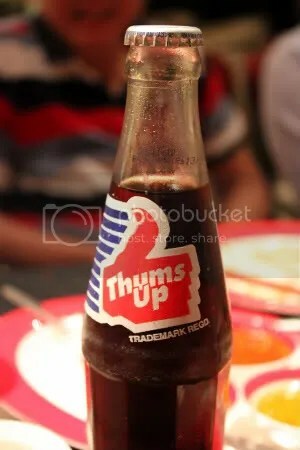 Let me introduce you to the local version of Coca Cola, Thumbs up. It is owned by the Coca Cola company and it does look an awful lot like Coke. This version is carbonated and made of spices like the conventional Coke, but a slightly different blend is used. The spices taste very familiar, but I can’t exactly put my finger on which ones were used. Not bad, but the taste is acquired! 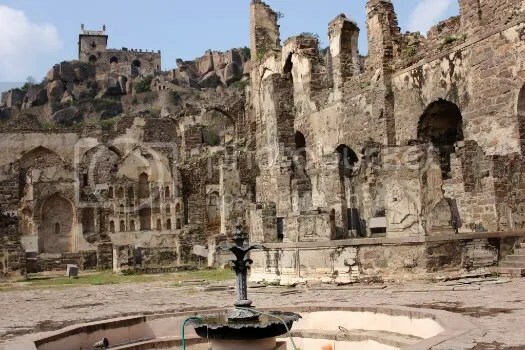 Another must-visit in Hyderabad is Golkonda Fort. The place is in ruins but with just a little imagination and help from a guide, you can imagine how impressive this place once was. It involves a bit of a climb up many uneven steps( not as bad as the great wall of China though. I was young but I remember huffing and puffing up the uneven steps there) but the resulting sights of the city is worth it. Every place here is abound with history and nuggets of interesting trivia so it would be helpful to hire a guide to bring you around. Indulge yourself in a little history lesson and I promise you it’ll make the climb much more worthwhile. 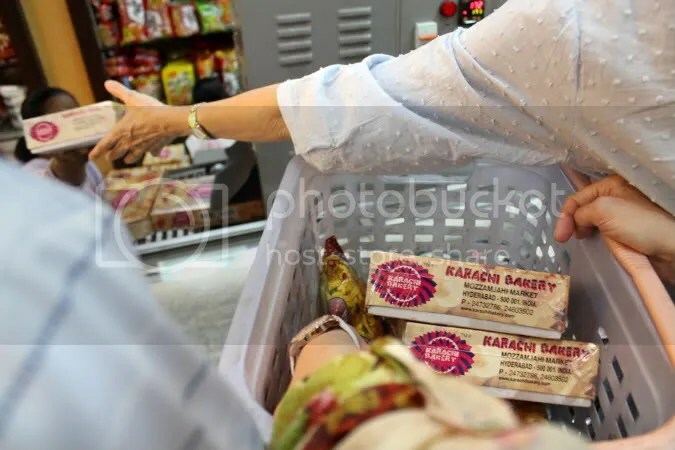 Before you leave, don’t forget to stock up on some vegetarian fruit biscuits from Karachi Bakery. These thick square shaped biscuits taste like butter shortbread, but are uniquely flavoured by the little chunks of ‘fruit’ inside (like those they use in commercial fruitcakes). I like the flowery scent which I think comes from the ‘fruit’ that may have been marinated in rosewater. Their almond biscotti are also really good- crisp and extremely addictive you just can’t stop munching on them! 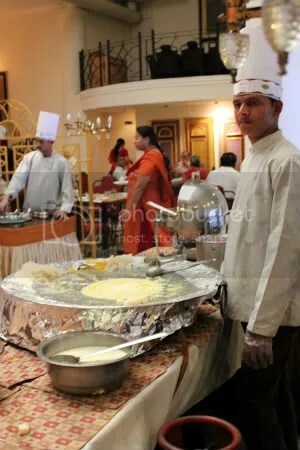 Hot Indian-style dessert made in front of you at a vegetarian buffet owned by the Biligiri Group. Feel free to customize your favourite ingredients on the huge pan-like thing. 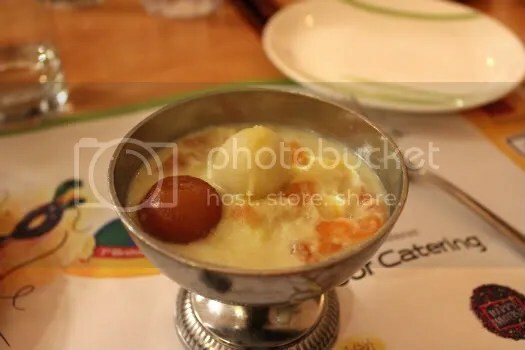 This is a traditional Indian hot dessert. I liked it quite a lot because of the ghee, sugar and milk used but dad found it far too sweet. I especially enjoyed the candied orange rind in the gooey mixture for its citrusy flavour that went well with all the milky components. Hated the ginger ball though ( that brown thing). 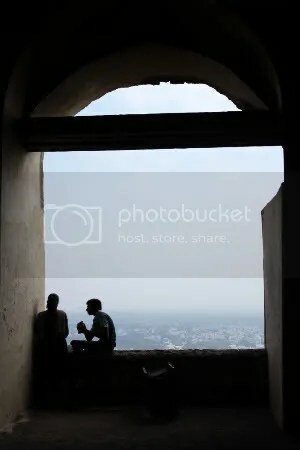 We had a lot of fun interacting with people, eating and sightseeing in Hyderabad. Our hosts were extremely hospitable people and for that we were all thankful. I won’t mind returning for another mission trip to India next year!